Confession: I troll ebay. Unlike some of my favorite swap-partners, I haven’t become buddies with the lovely Naz at Canada’s The Perfume Shoppe, I haven’t maxed out the credit cards at luckyscent.com, I haven’t asked relatives making a trip to Paris to bring me Serge Lutens bell jars from the non-export line, and I don’t have the Washington, DC Chanel boutique’s phone number on speed dial… (you know who you are!) No, me, I’m an ebay shark… I have a constant search going for “Vintage perfume,” and – not to toot my own horn – have snagged some real, rare bargains over the summer. Some of them I love. For example, I might sell my soul for some vintage, perfectly-kept, Emeraude parfum. 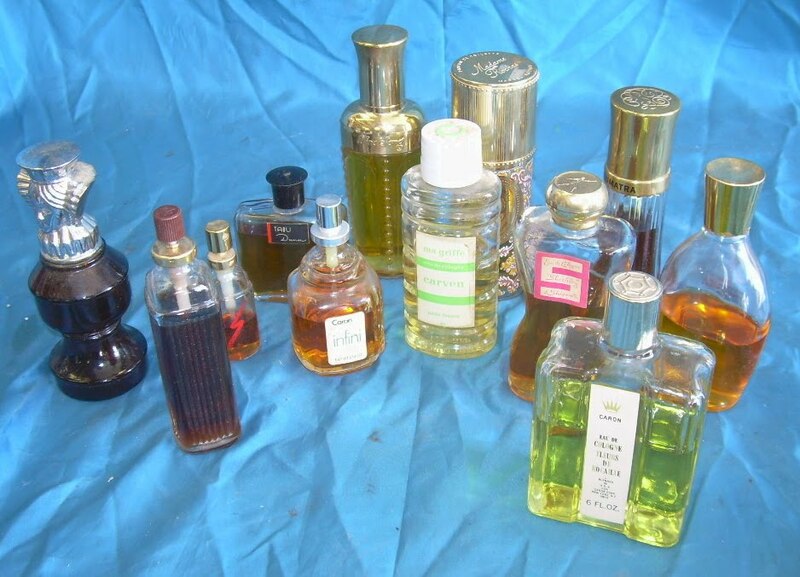 In fact, if I had to downsize my perfume collection to one scent (the thought hurts my head! ), it would be vintage Emeraude. And I have two bottles of vintage Chanel No. 5 parfum, one more beautiful than the other, that make it easy to see why it’s sold so well over the years: this stuff is stunning. And I have a teeny-tiny bottle of Jolie Madame parfum that is so gorgeous that it nearly brought tears to my eyes. Some of the vintage scents are interesting, but not really to my taste. Balenciaga Le Dix was much like Chanel No. 19 in feel, if not in actual smell – cool and businesslike, but lacking the boot-stomping oomph that makes me love No. 19. Patou Adieu Sagesse was pretty for an hour, with a fresh carnation that made me smile, followed by a fast fadeout. Lucien LeLong Indiscret was a richly peach-citrus floral that felt like Real Perfume – and then it degenerated into a Youth Dew mess (as you can guess, I’m not a fan of the big resiny orientals; more on that tomorrow.) Coty L’Origan parfum was, yes, a near twin of Guerlain L’Heure Bleue, but without the angel’s wings that lifts L’HB into the air. Vintage Arpege is so rich that wearing it feels like eating way too much dinner. And some of these vintage scents are just awful! I cannot always tell whether the scent has suffered from age or problematic storage, or whether my tastes are sufficiently modern that I find these scents unattractive. Or, of course, whether I Just Don’t Like Them, which happens with even well-received modern niche scents like L’Artisan Passage d’Enfer (Pine-Sol shaving cream!) or Iris Pallida (sweaty old man wearing faded cologne). Lanvin Via was a big ol’ chunk of galbanum that never eased into the promised florals; so was Estee Lauder Private Collection parfum. Caron Infini confirmed for me that I must really dislike lactones. Then, too, I’ve gone through the looking glass, searching for perfumes from my own scented past. Sometimes I think to myself, Wonder what the original Chloe, or Aspen for Women, would smell like to me now? or Sure wish I could remember what the original Victoria by Victoria’s Secret smelled like, and I really wish I’d had the money to buy some way back when. Or, Boy, I really loved Emeraude and Tatiana back in the day; I’d love to wear them again. And then off I go to ebay, fishing in somebody else’s closet for a piece of my past. These are the difficult ones to open and smell again. Am I the same person? Clearly not. My nose knows somewhat better than it used to know, and I’m older/presumably wiser/different. My 70’s-era Coty Emeraude Parfum de Toilette is, unquestionably, Queen of the Drugstore Perfumes. It smells better than I remember, and I love it more than I ever did as a teenager in the 80’s. I had some Diane Von Furstenburg Tatiana eau de toilette in the late 80’s – which I remember as being the scent that my mother, the White Floral Hater and wearer of No. 5, thought was the worst thing ever; that 70’s bottle of parfum is beautifully spicy tuberose, and brought back memories of college. I also own an early-90’s bottle of Victoria’s Secret Victoria – fairly easy to find on ebay, and usually cheap, because Victoria’s Secret’s marketing department was dumb enough not to put any sort of identifying label on that pretty glass laydown bottle, making it difficult to identify by people who don’t remember what it looked like. Luckily (for me! ), the bottle is distinctive by shape and by the deep periwinkle-blue cap. Anyway, the top notes have suffered greatly, and it doesn’t seem to be just my own bottle – I have two other friends with bottles of this truly lovely chypre floral, and they both say the top notes are frightening, with various hints of Hairspray, Pool Chlorine, and Maple Syrup! However, patience is rewarded – ladies* used to smell like this airy concoction. 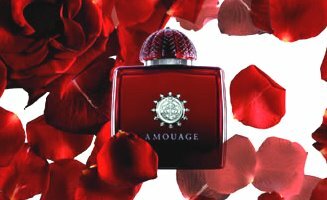 Official notes are impossible to find (trust me, I’ve searched), but I can definitely discern rose, violet, a hint of muguet, a wisp of tuberose, and possibly peony, followed by a lovely drydown of what seems to be sandalwood, vetiver, gentle oakmoss, and a cool, dry amber. * We won’t even discuss the enormous changes in Victoria’s Secret’s inventory and attitude since I first became aware of the brand, mid-1980’s, except to say that the idea of “pretty lingerie for women who want to feel feminine” seems to have been usurped by the idea of “garish undies for teenagers who want to show off said undies.” Enough said. My most recent vintage find? Balenciaga’s Michelle. Created in 1979 and discontinued some time in the 90’s, it was sold in parfum and in EdT. A review should be posted tomorrow – because testing it caused a seismic shift in my attitude toward perfume. Or the desk chair. Yes, summer is over and school has started. (Yippee!) I’m shaking small people awake every weekday morning now, packing lunchboxes full of nutritious goodies like applesauce cups and peanut-butter sandwiches, and ferrying my children to school on my way to work. And my husband has gone back to his school-year job, teaching agriculture at the university down the road; he’ll be farming on weekends until next summer. The house is empty in the afternoons after I come home from my part-time job, and there is time to write! Now I’ve only to go collect up the notes I made regarding perfume testing over the summer, which ought to be no help really, because my usual meticulous notes degenerated into 10-word descriptions. Oh, heck, I’ll just start over with the reviewing! I hope to be back on a three-to-four posts a week basis as of now. Well, it’s Thursday, and we’ve got a family trip planned for the weekend, so if I get a review finished I’ll post tomorrow and that will hit the average – for this week, anyway. Back tomorrow with a review of Balenciaga’s lovely, discontinued early-80’s Michelle. I’ve been asked that question several times by my husband, usually in a borderline-suspicious tone of voice: “Why are you so interested in perfume all of a sudden?” I’ll have a shot at explaining, because it is a relatively new interest of mine. A bit of history: I always liked perfume. As a child, I was abetted by my grandmother, who was fascinated with Avon and their quirky fragrance packaging. (At left, Willie the Worm Solid Perfume Compact, ca. 1974. Bambaw bought this one for me. I don’t remember how it smelled.) Growing up, I wore Avon’s Sweet Honesty, which I seem to remember being packaged in a Rapunzel’s Tower roll-on bottle. As a young teenager, I was given bottles of Cachet and Chloe, which I wore but never loved. 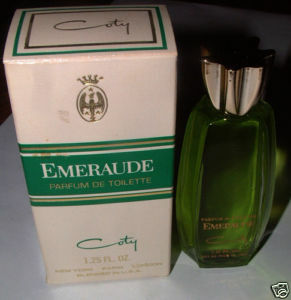 Later on, I fell in love with Coty’s Emeraude and used up a bottle of eau de cologne. As years passed, I wore Tatiana, Aspen for Women, Navy, Xia Xiang, and The Healing Garden In Bloom. My husband bought me Elizabeth Arden True Love, and when that bottle began to smell spoiled, I bought the bright floral Victoria’s Secret Pink. My fragrance choices were nearly always drugstore scents – because I believed that perfume should not be expensive. And if it was expensive, I didn’t need it. I laughed at the L’Oreal haircolor commercial that stated, “I’m worth it.” After all, perfume was a luxury item. Totally unnecessary. I could live with the cheap scents. Mom had always made do with her birthday-present Chanel No. 5 eau de cologne, or Anais Anais, or Coty L’Effleur. I didn’t need the designer stuff. I was slightly envious of my sister’s perfumes: Christian Dior Dune. 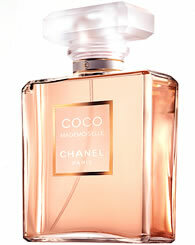 Chanel Coco Mademoiselle. Although they didn’t seem like me, they were clearly classier than anything I’d ever worn. And then came Velvet Tuberose. I was in Bath and Body Works late last summer, picking up some Aromatherapy Lavender and Vanilla lotion for the aforementioned sister’s birthday, and I was wandering around sniffing things. I picked up Chocolate Amber – bleah. I sniffed Black Amethyst – not me. I picked up Velvet Tuberose and sniffed. Sniffed again. And in a daze, I carried that bottle of Velvet Tuberose ($17, on sale) up to the register to buy it, only remembering the Lavender and Vanilla when it was time to pull out my wallet. Futzing around on the ‘net, I found perfume review sites like Now Smell This (http://www.nstperfume.com/) and Perfume Smellin’ Things (http://perfumesmellinthings.blogspot.com/) and Perfume Posse (http://perfumeposse.com/). And a whole new world opened up… I wear perfume for myself. I like the way I feel when I wear it. I might occasionally wear something my husband likes, just because he likes it – but mostly it’s all about me. I like the way perfume changes the way I think: it brings up memories, or suggests new ideas, or invites comparisons to music, to images, to stories and novels and poems. It opens up windows in my head. Wearing it is no longer an automatic “wear pantyhose, put on perfume” act, or an attempt to attract masculine attention (actually, it never was that for me). It’s become a form of art that I appreciate more and more each day. Posted on May 3, 2009 Categories The scented life1 Comment on Why perfume? I’m jumping into perfume reviews with a favorite: Vanille Tonka. I read the notes for this one on a perfume blog: lime, mandarin, cinnamon, carnation, vanilla, tonka bean, and frankincense – and immediately went looking for a sample. It’s rare that I guess correctly whether or not I’m going to like a fragrance, just considering the listed notes, but guess what? I was right. That doesn’t happen often enough in general, so just the fact that I was right (once!) is cause for celebration. The other cause for celebration is that this thing makes me giddy. Every time I spray it, I get happy. It seems perfect for chilly weather. I haven’t worn it in warm weather yet, and I’m not sure I’m going to, but the happiness factor guarantees that I’ll at least try it once. 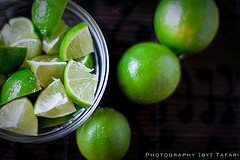 It starts out with a burst of tangy lime, and a hit of cinnamon oil. Remember those cinnamon-oil toothpicks the boys used to bring to middle school and pass around, before school authorities figured out how dangerous each and every thing brought onto school grounds can be? Those toothpicks smelled great, and if you chewed on one, it burned your tongue and cleared your sinuses. The cinnamon in Vanille Tonka isn’t quite that strong, but it’s not very foody. Likewise, the vanilla is not your average sweet marshmallow/custard/ice cream vanilla; it’s smoky and restrained. The carnation is present, only vaguely floral, underneath the vanilla and tonka base, and the whole thing is covered in a veil of frankincense, with its dry, lime-y, smoky depth. For me, though, Vanille Tonka is all about lime and vanilla, and I always get this mental picture: tipsy limes staggering around, dancing through the vanilla bean and cinnamon stick forest, laughing their heads off every time they bounce into a giant carnation. Sophisticated? Well, maybe next to a vanilla fragrance like Jessica Simpson’s Fancy. When I wear Vanille Tonka, it’s because I want a little fun. Blogging is new to me. And since this is the inaugural post for Muses in Wooden Shoes, it would make sense to lay out my expectations for this blog — its floorplan, if you will. The plan is that I’ll post three blogs a week, with the possibility of more, on subjects that interest me: novels, poetry, perfume, memories, the senses, music, God… Comments will be welcome. (Please, come in and have some soup!) I just ask that you keep your language such that your mother could read the blog without embarrassment. These vital messages are all expressed as verbs, and that fact in itself is a vital message. If one wants to BE, one must DO. That’s my hope for this blog: that as I Dream, Create, and Believe, I become more myself than I’ve ever been. Here’s to the journey.